iscover the latest updates to the ReportGarden app. This article lists the new features, enhancements, and fixes to pre-existing functionality that Release 19.3.18.65 had delivered. 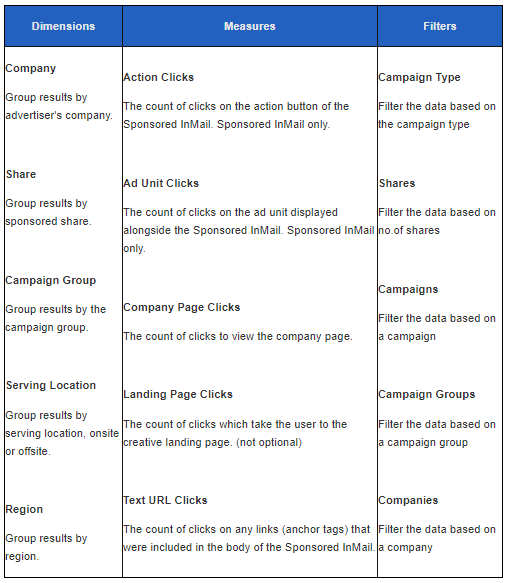 We have added few metrics, dimensions, and filters to the pre-existing list in LinkedIn Ads integration. We have added few Measures to the list of pre-existing Measures in DBM integration. The number of served video impressions, counted when the video clip was played or started by the user. Autoplays are not counted as part of video plays. Only one video play is counted, even if the user stopped and restarted the video. This metric is also known as "video plays." The number of impressions for which an ad clip played to the end of the first quarter of the video's total length. An event is logged once per impression. If the user restarts the clip, it's not counted again. For example, if the user plays a 40-second clip up to the 10-second mark, the event is logged. If the user replays the first 10 seconds of the clip, the event isn't logged again. If the user plays 5 seconds of the clip, then stops and exits the clip, no first quartile event is logged. Additionally, if the user skips over the first-quartile point in the video, no first quartile completion is logged. The number of impressions for which an ad clip played to the midpoint of the video's total length. An event is logged once, and if the user restarts the clip, it's not counted again. For example, if the user plays a 40-second clip up to the 20-second mark, the event is logged. If the user replays the first 20 seconds of the clip, the event isn't logged again. If the user plays 10 seconds of the clip, then stops and exits the clip, no midpoint event is logged. Additionally, if the user skips over the midpoint in the video, no midpoint is logged. The number of impressions for which an ad clip played to the end of the third quarter of the video's total length. An event is logged once, and if the user restarts the clip, it's not counted again. For example, if the user plays a 40-second clip up to the 30-second mark, the event is logged. If the user replays the first 30 seconds of the clip, the event isn't logged again. If the user plays 20 seconds of the clip, then stops and exits the clip, no third quartile event is logged. Additionally, if the user skips over the third-quartile point in the video, no third quartile completion is logged. The number of impressions for which an ad clip played to the end of the video's total length. An event is logged once, and if the user restarts the clip, it's not counted again. For example, if the user plays a 40-second clip up to the 40-second mark, the event is logged. If the user replays the first 30 seconds of the clip, the event isn't logged again. If the user plays 20 seconds of the clip, then stops and exits the clip, no third quartile event is logged. Additionally, if the user skips over the third-quartile point in the video, no third quartile completion is logged. The percentage of the ad clip that was played. For example, if a user plays 20 seconds of a 30-second ad clip, then the rate is reported as 66.66%. The percentage of the number of impressions for which an ad clip played to the end of the video's total length. For example, if a user plays 20 seconds of a 30-second ad clip, then the rate is reported as 66.66%. The number of times a user has skipped a video clip that was playing. This metric is only available on VAST 3.0 compliant publishers with skippable inventory, when "Include skip button" is enabled at the creative level. The number of impressions recorded for companion creatives, which are additional creatives that accompany in-stream video and VPAID creatives. The number of clicks recorded for companion creatives, which are additional creatives that accompany in-stream video and VPAID creatives. The percentage of viewable impressions out of all measurable impressions, calculated as (Viewable Impressions) / (Measurable Impressions). For example, say the ads on your site had 100 measurable impressions. That means there were 100 impressions where Active View tags were able to measure viewability. If only 10 of those 100 impressions were measured as viewable, then the site would have 10% viewable impressions. The number of impressions on the site that were viewable out of all measurable impressions. Video ads are considered viewable when at least 50% of the ad is visible while the video is playing for at least 2 consecutive seconds. Ads on connected TVs are considered viewable when they are served on a known connected TV device on a top publisher while the video is playing for at least 2 consecutive seconds. All viewable ads are measurable, because you can't confirm that an ad has met the criteria for viewability unless it can be measured. 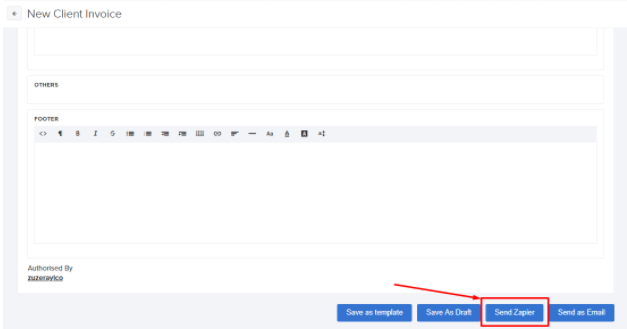 We have introduced Zapier connector in Invoicing module. Zapier is a tool which is used to connect applications to save time. Agencies use Quickbooks and other financial software to get the financial things done. They need a tool to send the advertising spend invoices to Quickbooks. 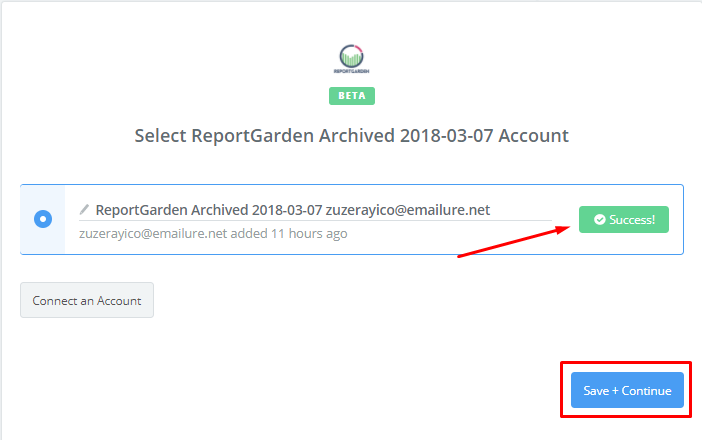 So, we integrated Zapier to connect ReportGarden with Quickbooks. 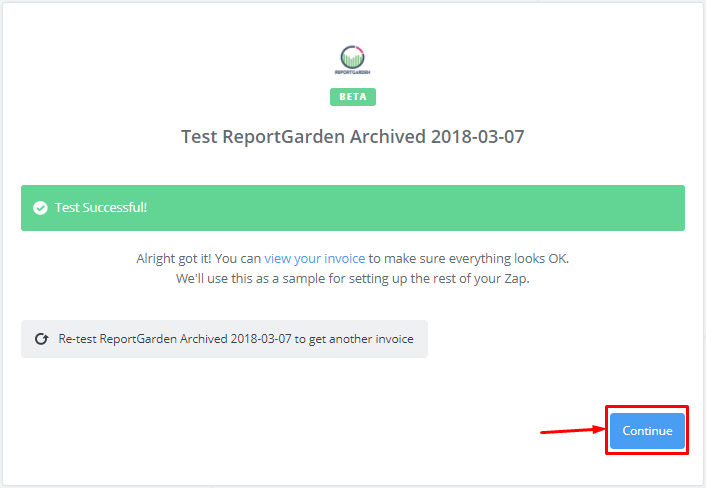 How to send an Invoice in ReportGarden to Zapier? Click ‘Send Zapier’ at the end of an invoice. You’ll see a pop-up to enter the email id of the of your client. 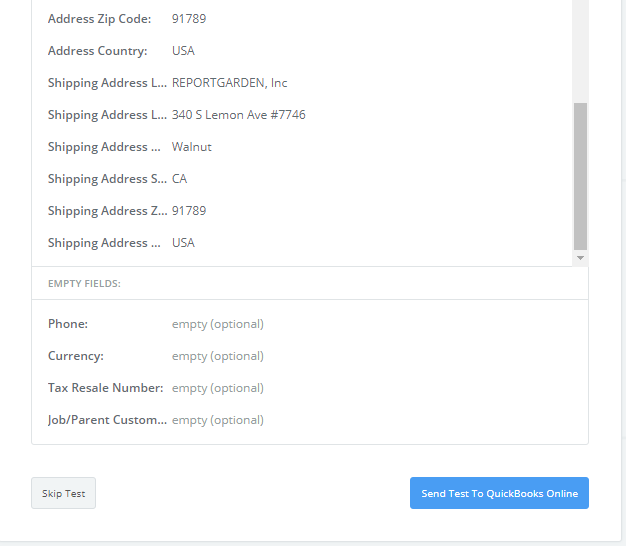 You should have his/her own Zapier account in order to connect ReportGarden with Quickbooks. You cannot edit an Invoice after sending it to the Zapier. To send an Invoice to Zapier, the email id of the client should match with the email id given in Quickbooks. Otherwise, the action will fail. In case, if you enter an email id which neither exists in ReportGarden nor Quickbooks, we will not display any error message in ReportGarden. But, in the backend, the action would fail and couldn’t send the invoice to the Zapier. 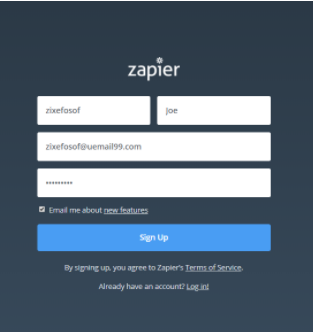 How to create an account in Zapier? Scroll down the page and click “Login to Accept Invite” button (if you’re not logged in.) Else, click “Accept Invite” button. You’ll see a page where you can create a Zap. Click “Create this Zap” button. You’ll see the steps to do on the left side navigation. You’ll see a trigger modal. 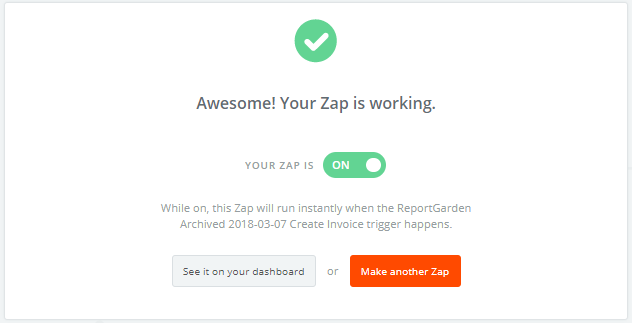 Click “Save and continue.” Enabling this trigger creates an invoice in Zapier when an invoice has created in ReportGarden. Click “Connect an Account.” You’ll see the authentication page. 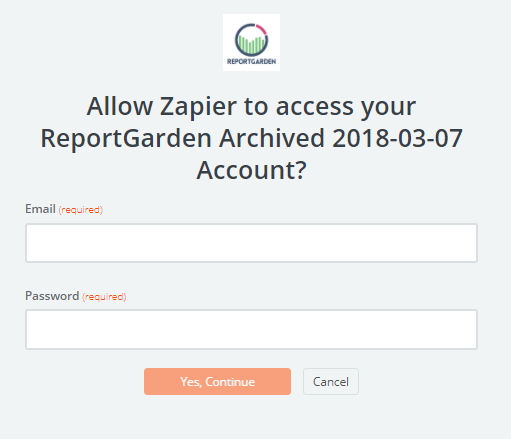 Enter your email id and password to access your ReportGarden invoices account in Zapier. Click “Test” button, if the action is successful, click “Save and Continue” button. 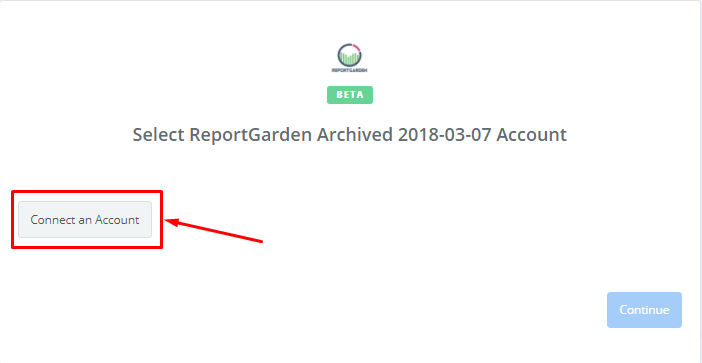 If you’d like to link another ReportGarden account, click “Connect an Account” again. You’ll see the most recent invoice in ReportGarden, which you’ve sent to Zapier will appear here. Click “View your Invoice” to see your invoice. Click “Continue.” You’ll see the modal below. You have to choose an app i.e. Quickbooks to proceed. 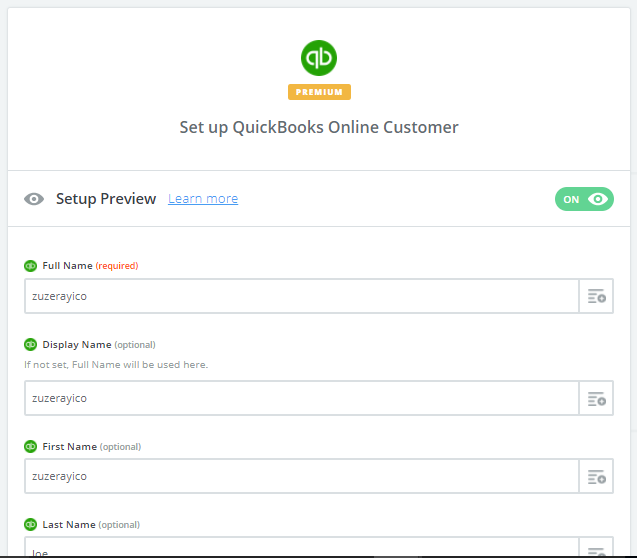 Click “Connect an Account” and authenticate your Quickbooks account. You’ll see the action steps whether you want to create an Invoice, customer or a receipt. Choose “Customer” to create a customer. You’ll see a modal to enter all the details like email id, phone number, shipping address of your customer. If you’d like to test Quickbooks, you can send a test email. Else, skip. If the action is successful, you’ll see a confirmation message that you have sent the test customer to Quickbooks online. Else, you’ll see an error message. You’ve done creating a customer. Now, you have to create an invoice. 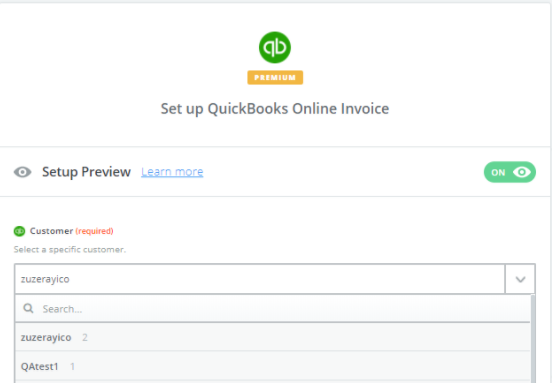 To create an invoice, choose “Quickbooks online” app. Click “Continue.” You’ll see a form waiting for your inputs. In Customer drop-down, choose the customer which you have created earlier. Again “Send test.” Else skip. Your zap is ready, switch the toggle ON. Switching the toggle ‘ON’ ensures that whenever an invoice is created in ReportGarden, instantly it triggers in Zapier. Now, go to ReportGarden app. Click ‘Send Zapier’ button at the end of an invoice. Now, go to ReportGarden app and start sending your invoices to Zapier. You can see all the tasks in the Task history. In Tasks page, filter it with zap name and status of an action. We have introduced Localization feature in the app. Using which you can change the pre-existing language in the app to your local language. We have 6 languages in the app including English. All Sign-in and Sign-up pages will be in the English language. We are releasing this in feature access. Request for Localization feature access. We are providing Localization to the customers who had asked for localization for their team. Localization effects all the modules in ReportGarden app. Change in local language changes the local language in the Client Portal also. The local language is independent of the sub-account language pack. All Past Reports, Dashboards, Invoices, Leads, SEO, Budgets, Templates, Proposals, Approvals changes with the change in local language. We cannot change the language of the past Scheduled Reports. How I change the language in ReportGarden app? Click on the user icon present at the right corner of the page. In “Select Language” field, choose your preferred language. Applying local language and “language pack in the sub-account” changes the metrics and dimensions in Reports, SEO to the applied language and rest to the local language. For example, you choose the “Spanish” language pack in AdWords sub-account and French in the local language. Still, all the metrics, dimensions in Reports and SEO be in Spanish and doesn’t change to French as language pack is applied. Local language in Client Portal depends on the Local language in RG app. 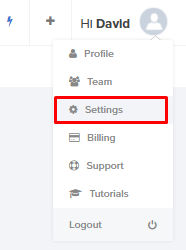 The text (drop-down, filters, report name, dashboard name, account manager etc.) in Client Portal will be in French language. Any error messages like “Relink needed”, text widgets in the Report, will be in French language. The metrics and dimensions in Reports will be in Spanish. 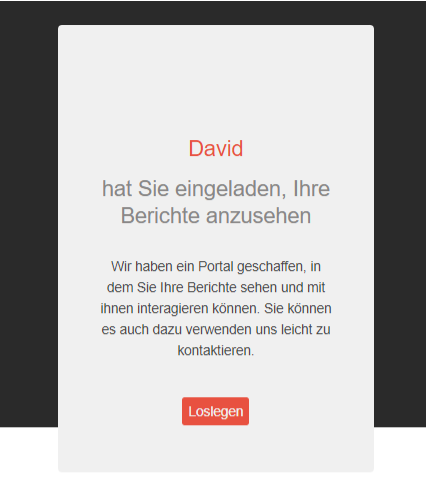 The text in the email which the user sends while inviting his/her client will be in the chosen local language. If your client is visiting his/her client portal for the first time, the default language will be the app-local language i.e. the ‘password’ and ‘confirm password’ fields will be in English and the Client Portal will be in the local language. Teams who don’t have localization feature access, will see the app in the English language as before. Agency clients cannot see any drop-down to change the language in client portal. Client Portal will be displayed in the last chosen local language. If your client is visiting his/her client portal for the first time, the default language will be English i.e. the ‘password’ and ‘confirm password’ fields will be in English and also the client portal page will be in English.